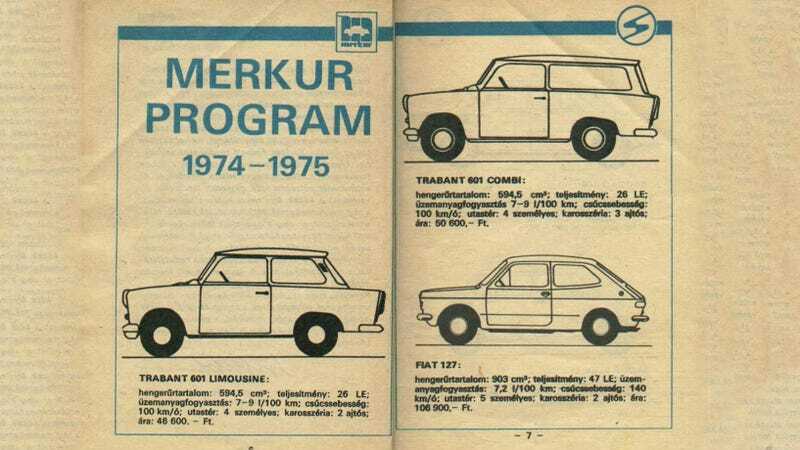 Here's the official Hungarian car catalogue from 1974 issued by the state-owned Merkur Company, your one and only choice. If anything, it proves that when the Russians take over your country, you're screwed. You already know how hard it was to get a Trabant in the eighties, but the situation wasn't any better a decade earlier either. While Hungarians got the right to purchase such goods in 1968 in an attempt to boost the economy, the waiting lists were longer than a Lamborghini Aventador's on its premier day. The top image also reveals that you had to pay more than double the price of a Trabant for a Fiat 127 (which they called the Torino Fiat to make sure you don't confuse it with the Polish FSOs), in case it was expected to be in stock anytime in the next following years. Color choices were more of a wish than anything else. Delivery time? 1-2 years, but the 110R Coupe only existed in the catalogue. A few made it over for the well-connected, but you had a better chance of getting one much later from across the border. If you're after something a bit cheaper or needed a car earlier than the end of your life, there was the Wartburg with a two-stroke from East Germany, or the horrible NSU clone, the air-cooled ZAZ-968 from Ukraine. The latter was a truly dreadful car, and you still had to wait 5 months to get one. For those with the cash, the 1.2 Lada (VAZ-2101) was the obvious choice. After about a year or so (which could be anything, really), and you could end up with a rear-wheel drive sedan designed by the Italians but adjusted to the Soviet conditions. Ladas really weren't that bad, as long as you took them apart and put them back together yourself on day one. Russian build quality was similar to what the Western countries have experienced from British Leyland. The Lada wagon was practical (we had three when I was little, a blue, a red and a white) and the 2103 with its 1.5 engine, rounded instruments and double headlamps was so cool they didn't even tell you its price back in 1974. Which probably meant it was a no go. Today? Good luck finding an original one as it became a collected classic. So, what about the Dacia than? Well, it was a French car built by Romanians. There was a joke going around at the time that the ones built on Wednesdays were okay, but apart from the short delivery time, nothing justified its price. The Moskvitch wasn't any good either, using Opel's technology captured during the Second World War. The real players got Polski Fiats, no question about it. These might have been built in Poland, but with their 1.5 engines, the "grand Polskis" were the fastest and most luxurious of the bunch. The Italian refinement had its price though as you could buy 2 Trabant wagons as well as taking your family to a (Soviet) holiday for the same sort of money. Finally, let's leave the Volgas for party members. Most had to, but it turned out they were better off without the thirsty Russian anyway. And for those who made a bad choice or got fed up with motoring all together after going through the purchase process, Merkur's used car sales could bring some relief. Here's one from 1975, happy tagging to all!